Below is Costa Magica leaving Amsterdam at the 19th of may 2009. She is a sister to Carnival Destiny, the first cruiseship ever to be larger then 100.000 tons. 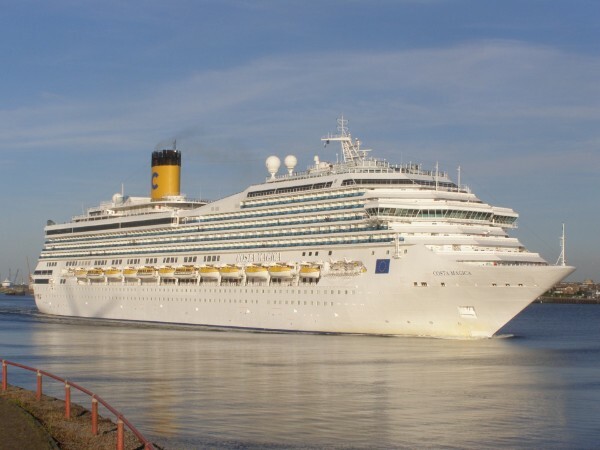 Costa Magica was, at the time she floated out, one of a pair of two ships that were the largest ships of Costa Cruises and the largest ships under the Italian flag. She is a direct sister to the Carnival Destiny, launched in october 1996 as the largest cruiseship in the world and the first one to exceed 100.000 tons. The only external change of her Carnival sisters, that are besides Carnival Destiny the Carnival Triumph, Carnival Pride and Carnival Miracle, is the funnel. Instead of Carnival's iconic winged funnel, she recieved a more classical looking, chunky funnel that was typical for the newer Costa ships. Costa Magica is measured at 102.578 tons, compared to her sister Costa Fortuna she is slightly smaller, as Costa Fortuna is measured at 102.587 tons. The ship is 272,20 meters long, 35,50 meters wide and her draft is 8,20 meters. Her passenger capacity is 2704, but this is measured on a two-per-cabin basis. Her total capacity, including extra bedding in the cabins, is 3470. She has 1359 cabins, of which 907 are outside-cabins and 464 of these have a balcony at their use. Her crew capacity is 1027. The normal cruising speed of the ship is 20 knots, although she is capable of sailing at 22. Costa Magica seen between the IJmuiden piers from the North side at the 31st of may 2017. Unlike their Carnival sisters, Costa Magica and Costa Fortuna were not built at the Fincantieri wharf at Monfalcone, Italy, but they were built at the Fincantieri wharf at Sestri Ponente, near Genoa. Costa Magica was built under yardnumber 6087. But not the whole Costa Magica was built here, because a part of her hull was built at Palermo and it was towed to Genoa where it was fitted to the rest of the ship. This part was launched in february 2002. The total ship was floating out of her building dock at Sestri at the 14th of november 2003 and she took almost a year to be completed before she was delivered to Costa at the thirth of november 2004. After her delivery, she sailed from Genoa to Barcelona, where she was named three days later by the Spanish actress Paz Vega. Just after the traditional breaking of the bottle, there was a true flameco performence named 'el compas del tiempo' (in step with times) in the theater, performed by Christina Hoyos. The ship then took off to one of Costa's main passenger terminals, located at Savona, Italy, from where she undertook a two-day introduction cruise that brought her to, well, Savona. After this, she set sail at the 10th of november 2004, for her true maiden voyage from Savona in the Mediterranean sea. Her initiaries are very normal for a Costa ship since then, sailing the Caribbean in winter and the Mediterranean in summer. Since a few years, she is also seen at more northern destinations in Europe, including Amsterdam. 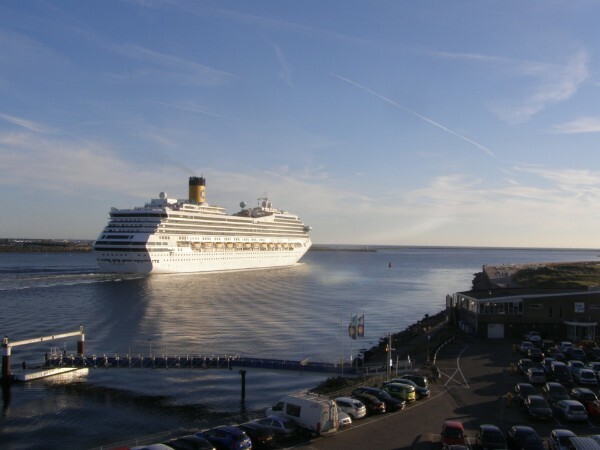 For Costa, Amsterdam is also a main departure port for cruises in the northern part of Europe, next to Copenhagen. Costa Magica leaving Amsterdam as seen from the Stenen Hoofd (Stone Head), which is a disused desolate pier from which good photography is possible. As with all modern Costa ships, also Costa Magica has a theme. For her, all magical places in Italy are featured inside, as she is based on the most beautiful Italian towns like Capri and Portofino, Urbino, Grado and Spoleto. Her lounges and restaurants feature some spectacular murals and fresco's all representing the best of the homecountry Italy. The magical hub of it all is a nine-deck high atrium. In her shopping mall, true designer stores are there to spend your euro's. Outside, she also has a lot to offer, for example the Meratea Deck, shaped like a roman amphitheater. In several suites, magical artworks are among the decorations, made by the Brera Academy. This public academic institution is situated in the centre of Milan, and founded in 1776 by Sovereign Maria Theresa of Austria. For the youngest guests, Costa has the Squok Club where children of all ages above three are entertained and a lot is organized to keep them busy.Costa Magica sailing towards the open sea, again at the 31st of may 2017. You might as well take a closer look of her interiours here.